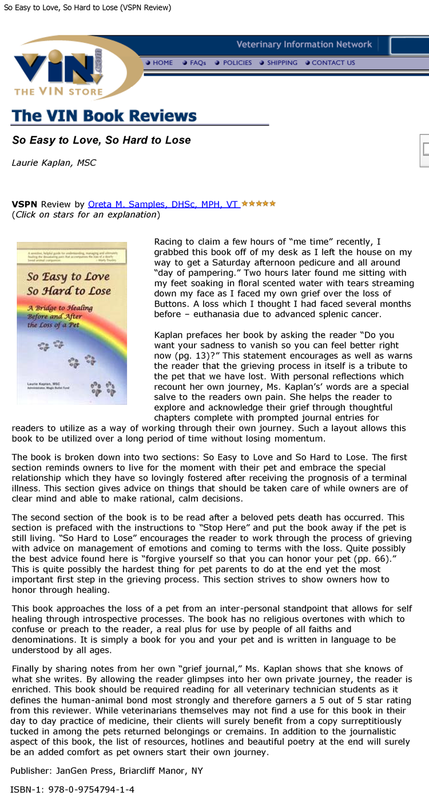 SO EASY TO LOVE, SO HARD TO LOSE ‘A Bridge to Healing Before and After the Loss of a Pet’ by Laurie Kaplan MSC is one of those books you wished you’d read years ago. So that the heart ache on losing your first pet could somehow be less traumatic and emotionally draining because, having put into place and practice Laurie’s helpful tips, you are then equipped to deal with that loss. But of course, nothing really can prepare you for that ultimate loss and you have to go through the grieving journey as best you can and arrive at your destination, hopefully still in one piece, your heart scarred for life, but ready to face the world again albeit without your beloved pet. The publicity blurb which accompanied the book tells me that 63% of all households in the US own a pet, and that 84% of caretakers consider their pets to be members of the family. And those experiencing pet loss grief are often deprived of support. and provides support and validation for grieving pet owners. I read Laurie’s book and was impressed with the simplistic style of writing; I have read other books which have, in my humble opinion, been too ‘distant’, too ‘observational’. Laurie’s book is very definitely ‘hand’s on’ and it does feel as if she is holding you personally by the hand and gently leading you through this perhaps unchartered course where at times we are apt to flounder because we don’t know what to do next, who we can trust to talk to, or how long we’ll feel this wretched. The book is separated into two sections: the first: ‘So Easy to Love’ deals with ‘The Magical Bond’, ‘Embrace the Final Days’ and ‘End of Life Care’ – each section broken down into one-page-at-a-time-read with a question and answer section on the opposite page. At the top of each question and answer page is a space to put that day’s date and the idea is to see how far you’ve come on your journey of loss over a period of time. The second section is: ‘So Hard to Lose’ and covers ‘After the Loss’, ‘Is it true?’, ‘No Regrets’, ‘The Emotional Roller Coaster’, ‘You’re Not Alone’ and ‘A Bridge to Healing’. Once again each section has a-page-at-a-time-read with the opposite page having questions and answers to work through. I found all the sections quite comforting and Laurie’s style is neither invasive nor judgemental. As Jim Willis writes on the back cover: ‘The loss of a beloved pet can be devastating. Laurie speaks from experience and eases us toward acceptance. This book is a comforting hug between two covers.’ And I have to agree with Jim: it IS a comforting hug between two covers. There is a section towards the end of the book which charts Laurie’s own personal journey of grief and how she came to set up the Magic Bullet Fund and help 100’s of dogs and their families through cancer treatment. When someone writes of personal experience then you can trust their judgement and know that what they are writing about makes sense. I know from my own personal experience of pet loss, grief can takes months to work through and if you are surrounded by people who don’t understand the depth of your feelings, it is often hard to work through that grief because you find yourself NOT crying to save someone else’s feelings rather than thinking of your own. Have a copy of Laurie’s book on your shelf; read it when you don’t need it and then when you do, you’ll already feel like you have a friend nearby who really cares about you and what you are now going through. I love this book because not only does it offer practical, down-to-earth advice and sound information regarding pet loss, but it is also one of the only books I’ve read that really addresses anticipatory grief and the often-intense feelings of loss that many pet owners face even while their pets are still alive. The book is written so that it can be used as a workbook for pet owners – featuring pages that ask pet owners to reflect on their feelings and ask thoughtful questions to help guide individuals through their feelings of grief and loss. It also includes sections about end-of-life issues and quality of life – to help guide pet owners in making decisions about euthanasia and how to prepare for your pet’s eventual passing.